Gaunce suffered a second-degree shoulder separation on October 19th in a game against the Sudbury Wolves. The injury caused the 6-foot-2, 215-pound forward to miss nearly a month of action, eight games in total. Not only did the injury halt any energy Gaunce had entering the season after a summer spent working out and bettering himself, it also caused him to miss the OHL All-Star game against the Russian Selects. Like any player coming off an injury, it took Gaunce a few games to get back in his groove after only mustering seven points in the 13 games after the injury, which is far from Gaunce-like numbers. ”It was my first injury like that,” said Gaunce. “I didn’t know what mentality to go into the game with because I had never had that pain before or anything like that to play with, but as of now it’s perfectly fine. Twelve days off can do the body wonders and also refresh the mind. Gaunce came out of the break with a new outlook on the way he wants to play. Already known as one of the top defensive forwards in the league, the Canucks 2012 first-round selection wanted to add a little more offense to his game and he has done just that. In 13 games since the break, Gaunce has grabbed 17 points (9-8-17), is a plus-12 and has been named First Star of the game on four occasions. 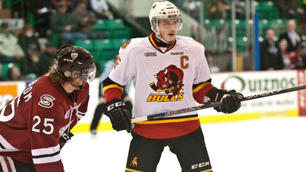 Gaunce took it to another level in a new position on January 5th, the day the Bulls acquired Tyler Graovac from the Ottawa 67’s. 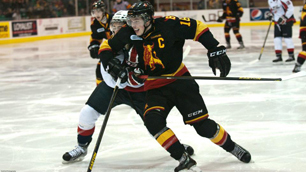 Graovac, a highly-skilled centreman, was destined to play on the Bulls’ top line, and with Gaunce already holding down the fort as Belleville’s number one center, Bulls head coach and general manager George Burnett made the decision to move Gaunce to left wing in order to ice a potent number one line. The switch to the wing paid off immediately for Gaunce and the Bulls, as he and Graovac, along with right winger Austen Brassard, combined for 12 points in a 6-2 win over Sault Ste. Marie, each registering four points in the first game for the new-look first line. Three games later, Gaunce and Graovac were at it again, this time against the Niagara IceDogs on national television. The dynamic duo combined for eight points in a 7-2 win over the IceDogs, each grabbing four points. It’s safe to say the change to left wing has been pretty easy for Gaunce, who had only played a few shifts on the wing in his rookie season in the OHL and also played the wing a bit for Team Canada at the under-18 tournament in 2012. “I think it’s been a pretty smooth adjustment,” said Gaunce. ”Obviously it was a bit different the first few games because most of my mentalities were as a centreman and playing defensive, but playing left wing you have more chances to create offense off the wing. With the system we have in place and with Graovac playing on my line, if I don’t feel comfortable we can switch during the games. As good as Gaunce is right now at the junior level, he remains humble, knowing he will need to improve on a few things before he makes the jump to the NHL. Now Gaunce and the Bulls, who sit in second place in the OHL’s Eastern Conference with 60 points, will look to continue their torrid pace and make some noise in the post-season. Photo credit to Don Carr.